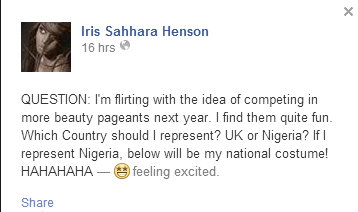 Nigerian-UK Based Transgender Mocks Nigeria Yet Again! I just think this man/woman is beginning to take a piss and he/she should shut the hell up and live HIS/ her live without seeking undue attention. So basically he/she shared the above costumed picture on the right stating that he/she is thinking of contesting for international beauty pageants next year and don’t know whether or not to represent Nigeria. And if she did represent Nigeria, the pic will be her costume! Funny isn’t it? IDIOTA!!! Just respect people’s tradition…they are humans and just as you seek acceptance, they also have freedom to dress and appear the way they wish! It is called “Freedom of expression”. I never had issue with this Naija transgender, but he/she keeps hauling insults at Nigeria. Is that how to fight a cause? *SMH* I find it offensive, while others might find it funny! This entry was posted in Entertainment, Fashion trends and tagged Nigerian UK Based Transgender Mocks Nigeria Yet Again. ← Are You On Joocalls Yet?